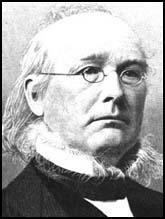 Horace Greeley was born in Amherst, New Hampshire, on 3rd February, 1811. He trained as a printer but he later moved to New York City where he became a journalist. Greeley worked for the New Yorker and in 1841 established the New York Tribune. A newspaper he was to edit for over thirty years. Greeley took a strong moral tone in his newspaper and campaigned against alcohol, tobacco, gambling, prostitution and capital punishment. 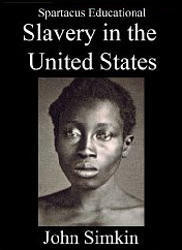 However, his main concern was the abolition of slavery. In 1838 Greeley agreed to edit the Jeffersonian, a Whig newspaper in New York. A close associate of William Seward, Henry Clay and William Harrison, he edited the pro-Whig journal, Log Cabin, during the 1840 presidential election. Greeley was very interested in socialist and feminist ideas and published articles by Karl Marx, Charles Dana, Margaret Fuller and Jane Grey Swisshelm in the New York Tribune. He also promoted the views of Albert Brisbane, who wanted society organised into co-operative communities. After the demise of the Whigs, Greeley supported the Free Soil Party. He was one of the leaders of the campaign against the 1850 Fugitive Slave Law and in 1856 helped form the Republican Party. In 1860 Greeley supported the presidential campaign of Abraham Lincoln. However, Greeley, like many of the strong opponents of slavery, was unhappy with the way Lincoln dealt with John C. Fremont and David Hunterwhen they freed slaves in territory they captured from the Confederate Army during the Civil War. On 19th August, 1862 Greeley wrote an open letter to the president in the New York Tribune. In the letter Greeley critized Abraham Lincoln for failing to make slavery the dominant issue of the war and compromising moral principles for political motives. Lincoln famously replied on 22nd August, "My paramount object in this struggle is to save the Union, and is not either to save or destroy slavery. If I could save the Union without freeing any slave, I would do it; and if I could save it by freeing all the slaves, I would do it." Greeley wrote several books includingGlances at Europe (1851), An Overland Journey (1860), a two volume history of the Civil War, The American Conflict (1865), and an autobiography, Recollections of a Busy Life (1868). Greeley was highly critical of the presidency of Ulysses G. Grant and became associated with the Radical Republicans. Later he helped form the Liberal Republican Party. 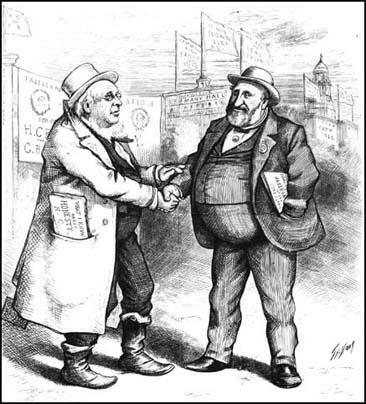 In 1872 he Liberal Republican Party nominated Greeley as their candidate and he stood against Ulysses G. Grant for the presidency. During the campaign Thomas Nast produced a series of cartoons attacking Greeley. He commented that the venom of these cartoons were so bad that he "scarcely knew whether he was running for the presidency or the penitentiary." Greeley, won 40% of the popular vote but died soon afterwards on 29th November, 1872. One friend claimed that he had been "crushed by the unmerciful ridicule Nast had heaped on him." (3) Horace Greeley interviewed Brigham Young for the New York Tribune in 1859.